Visiting Sydney for work? If you have some down time in between meetings and are looking for something to do, why not get out and explore all that the city has to offer. Known for its stunning harbour, there’s so much to do in Sydney, from the historic Royal Botanic Gardens and Rocks area, to limitless shopping opportunities and trendy coffee spots. Below is your guide for things to do in between business meetings in Sydney. Right in the heart of Sydney is the oldest botanic garden in Australia. Sydney’s Royal Botanic Gardens is open from 7am all year round and features an outstanding collection of plants from around the world, not to mention a spectacular view of the Harbour Bridge and Opera House from Mrs Macquarie’s chair. The Gardens holds free guided walking tours between 10.30am and 12pm daily, starting from the information booth, or you can show yourself around if you’ve only got a short break. You can also shop for plants at the Growing Friends’ Nursery. The nursery has a great range of native, exotic and rare plants for sale and buying them supports the Garden’s various conservation projects. Why not take a rare plant home as a souvenir of your trip to Sydney? Alternatively, if you’re visiting during the warmer months, take a dip at the Andrew (Boy) Charlton Pool. Just by the Royal Botanic Gardens, it’s $6.20 entry and has a licenced cafe on site. Located in a grand harbourside building in Circular Quay, the MCA Collection contains over 4,000 words by Australian artists, including paintings, photography, sculptures and moving images. MCA opened in 1991, reopening in 2012 after major expansions. If you have a break from meetings around lunchtime, there are free guided tours on weekdays at 11am and 1pm. Or if you’re around later in the day, the MCA Cafe on Level 4 boasts some of the best views of the harbour and is open until 5pm daily, and until 9pm Wednesdays. See where European settlement all began in Sydney’s historic Rocks area. The Rocks is just a five minute walk from Circular Quay, or 10 minutes from Wynyard Station. The cobblestone laneways are home to some of Sydney's oldest sandstone terraces, artisan markets, and friendly pubs. The Rocks Markets are held every Saturday and Sunday from 10am to 5pm and are a great place to grab some unique Australian souvenirs to take back home including handmade arts, homewares, jewellery and clothing. If you’re after a drink, check out The Australian Heritage Hotel. Built in 1824, it has a long list of Australian beer and wine and delicious pizzas. The Glenmore Hotel is another popular spot, with amazing 180 degree views of Sydney Harbour from its spacious rooftop bar. For coffee lovers you can go past Surry Hills. 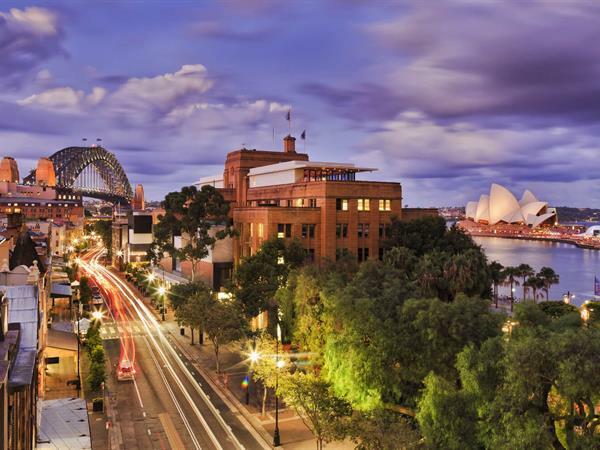 Get out of the hustle and bustle of the inner CBD and visit Sydney’s trendiest area. For a quick coffee on the go, Neighbourhood on Buckingham Street is perfect. Only opened in 2016, it’s a tiny hole in the wall operation selling carefully brewed coffee. Gratia and Folonomo is another must visit. 100% of the profits made after operating costs here are donated to charity. At the end of your meal, you have a choice between three charities that half your money will go to, the other half going to the venue’s own not-for-profit, The Pure Foundation, so if you’re feeling generous, this is the place to go. Other great coffee spots include Haven Specialty Coffee, providing coffee tailored to individual taste and preferences, and Paramount Coffee Project, where new beans from international roasters are introduced every month. If you want to kill some time with a bit of retail therapy, Sydney has some great shopping spread around the city. The Queen Victoria Building is a good place to start, with three levels of fashion, jewellery and gifts. Even if you don’t buy anything here, the 19th century architecture is a stunning site to see. Not far away is the Strand Arcade, another old colonial style area filled with jewellers, dressmakers, hatters and cafes. Walk through the Arcade and you’ll find yourself on Pitt Street Mall, the home of shopping in Sydney. With Westfield Sydney boasting over 250 stores, you’ll be sure to find something here. If your meetings run late into the afternoon, you might be looking for somewhere to wind down and have a drink. The Sydney CBD has some unique spots spread across the city if you know where to look. If you’re visiting in winter, Ash St Cellar is the perfect place to go to drink under a warm heater. Their French, Italian and Spanish inspired Tapas menu pairs perfectly with their extensive wine list. For something a bit different, The Barber Shop will impress you with it’s quirky barber shop style exterior. The bar features classic cocktails and long lists of whiskey, gin, rum, tequila and cognac, becoming one of the most popular Friday night venues. And for a drink with an awesome view, be sure to visit Hacienda in Circular Quay. The Sydney CBD has so much to offer beyond the four corners of your hotel room, so use your time in between meetings to get out explore the city. There’s something for everyone.